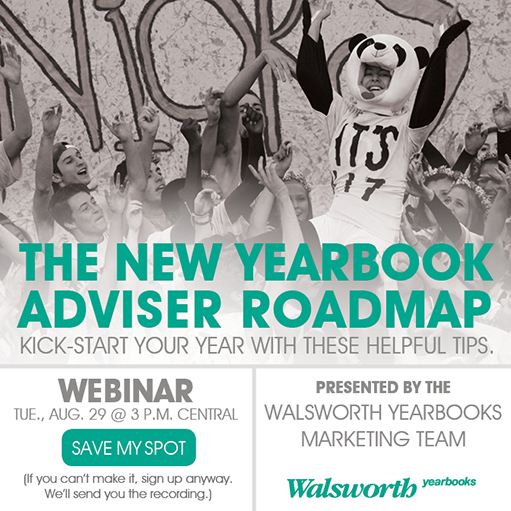 If you weren’t able to attend the live presentation of Walsworth’s Aug. 29 webinar, The New Yearbook Adviser Roadmap, don’t fret! A recording of The New Yearbook Adviser Roadmap webinar is now available for download to be watched at your convenience. Walsworth’s Alex Blackwell and Aimee Parsons kicked off our webinar series for this school year by walking new yearbook advisers through all the numerous resources Walsworth provides to help them. The presentation touched on everything from walsworthyearbooks.com and Members Only to the Yearbook Suite curriculum and Adviser Mentor Program. Download The New Yearbook Adviser Roadmap today.